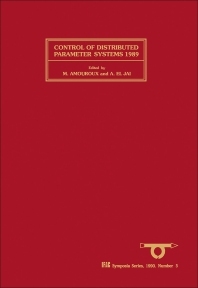 This volume presents state-of-the-art reports on the theory, and current and future applications of control of distributed parameter systems. The papers cover the progress not only in traditional methodology and pure research in control theory, but also the rapid growth of its importance for different applications. This title will be of interest to researchers working in the areas of mathematics, automatic control, computer science and engineering. For researchers working in the areas of mathematics, automatic control, computer science and engineering.